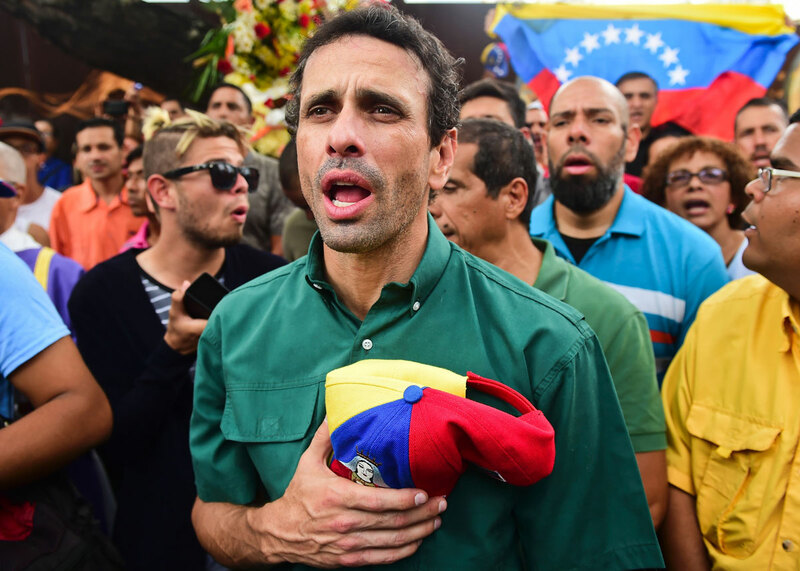 "Nothing that the government is doing is in defense; it's repression, savage repression that violates our constitution and human rights," Mr Capriles told BBC Mundo. Venezuelan opposition leader Henrique Capriles has told the BBC that early general elections are the only way to put an end to the country’s crisis. Mr Capriles accused President Nicolas Maduro of inflicting “savage repression” on the Venezuelan people. “How long can Maduro stand denying Venezuelans the right to vote? I don’t think much long,” he added. Nearly 30 people have been killed in protests this month and the economy is beset by shortages and inflation. “Nothing that the government is doing is in defense; it’s repression, savage repression that violates our constitution and human rights,” Mr Capriles told BBC Mundo’s Daniel Pardo. Mr Capriles lost the 2013 presidential election to Mr Maduro. Earlier this month, he was banned from political office for 15 years over alleged “administrative irregularities” in his role as governor of Miranda state. He described the ban as unconstitutional. Mr Capriles denied that the country was divided and said that “no more than 20% of Venezuelans” supported Mr Maduro’s socialist government. “There is no fight between different sectors of the Venezuelan people. That’s over in Venezuela. There is no division among Venezuelans,” he said. The current wave of protests began after the Supreme Court took over powers from the opposition-controlled National Assembly on 29 March. When the court reverted its decision three days later, it was too late to stop the street protests. “When this is going to stop? I don’t see the people giving up fighting for their country,” said Mr Capriles. The opposition is calling for presidential elections scheduled for late 2018 to be brought forward as they blame the socialist president for the political and economic crisis engulfing the oil-rich nation. “There is no electoral calendar. We’re the only country in the Americas where you ask when the elections are and there’s no answer,” he told the BBC. He also demanded the release of opposition politicians arrested since Mr Maduro took office four years ago. “They [the government] are, at this moment, like a kidnapper who’s surrounded by police but believes he will be able to kill the hostages, kill the police and escape unharmed. “They are wrong; they made a miscalculation,” said Mr Capriles. Venezuela opposition leader denounces ‘savage repression’. Mr Capriles attended a tribute to a student killed during this week’s protests.